Blush pink is a beautiful pastel color that's feminine and romantic. In a nail setting, you can get various shades from neutral to deep pink, as well as an assortment of stylish designs. Whichever look you decide to go for, it's guaranteed your dreamy blush nails will help you to stand out for all the right reasons. For a simple yet effective blush nail look, simply opt for one all-over color. A light pastel blush is particularly pretty on medium to deep skin tones whereas a darker blush will contrast magnificently with fair complexions. Either way, make sure that you file your nails and push down the cuticles for a smooth, elegant, and polished aesthetic. If you're looking for a glossy yet understated blush look that will make people do a double take, try a neutral shade. You can then create some pizzazz with gold or silver glitter tips. To achieve this effect, paint your claws with the blush color first and follow it up with a topcoat for added sheen. When your nails are dry, draw a line on the top of each nail using a cocktail stick at where you'd like your tip to start. Then fill in each tip with glittery nail polish. To develop nail contrast with a rose blush color, consider incorporating embellishments in a standout hue. Black and blush pink are the ideal combination for smart casual or formal occasions where you require a feminine, dressy nail look. To achieve this aesthetic, paint your nails in the rose blush hue in the first instance. Then, attach some black beads to the nails you'd like to accent using nail glue. Not bold enough for you? Finish the look by dipping a cocktail stick in black nail polish and dotting a funky leaf or floral design onto one of your nails. If you're a lover of all shades blush, you really can't be blamed! 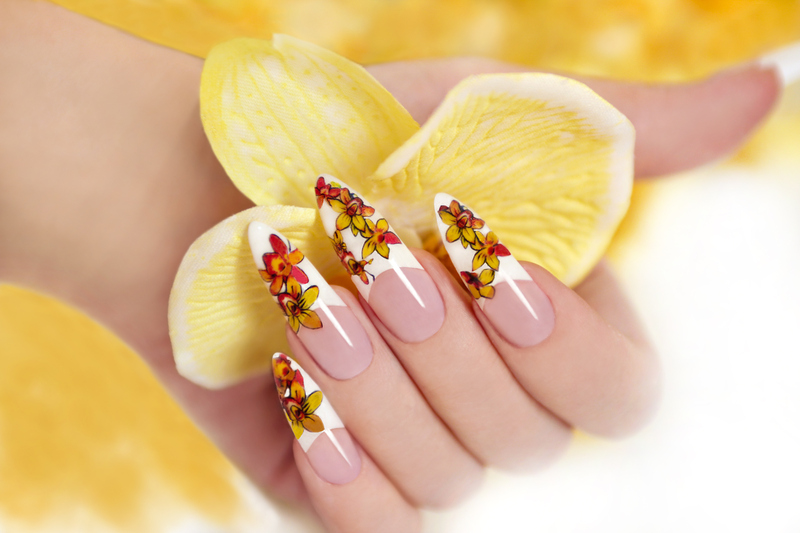 Depending on the design, your nails can go from tranquil and delicate to vivid and fierce in a heartbeat. Create a fun and unique aesthetic by using different shades of blush polish to paint each of your nails. The result is a youthful, summery aesthetic. To give your nails a cute, retro look that would make the hippies of the sixties jealous, try a deep blush pink hue with a white floral design. To get the look, paint your nails as you usually would with the blush color. Make sure you choose a matte nail polish to let your florals stand out and do the talking. Then, grab some nail decals and apply them to the nails you'd like to accent. Voila! Bored with the conventional one all-over hue? You can inject some personality into your nails by accenting your fourth finger with a clashing color and/or design. If you want to go Easter egg chic, pick an ice-cream blush pink for your main hue and a powder blue for your accent color. You can even add some sparkle to your accented nails through a glitter top coat or section. For a contemporary, fashion-forward nail look, try an ombre blush. If you use white as your second hue in this two-tone aesthetic, even better! This combo is sassy, distinctive, and ideal for a summer vacation. To create the gradient effect, apply the two nail polish colors side by side horizontally on a makeup sponge. Stamp it face down onto your first nail and then keep sponging on the color until the ombre effect is as prominent as you'd like. Wait for your nails to dry and then add a top coat. For a refined finish, clean up the skin around your nails using polish remover and a cotton pad. Perfect for a special occasion, use a light metallic blush-colored polish to dress up your nails. You can then accent a nail with a glittery topcoat or by applying sequined gems. For the latter, first, you need to wait for your blush nail polish to dry completely. Afterward, use some tweezers to grab a sequin, dip the bottom in nail glue, and then apply it directly onto your nail. Continue to repeat this process until you achieve the desired effect. If you're searching for a classy, subtle nail aesthetic, search no further! Choose a neutral blush with a pearly-looking accent design for the height of sophistication. You can achieve this look by using nail stencils on your accent nails and then adding glitzy beads or gems to finish. Nail art is a fabulous way of adding interest to your nails with minimal fuss. To achieve this gorgeous French aesthetic, choose an opaque blush polish and apply just one or two coats before leaving your nails to dry completely. Next, use a cocktail stick to draw a line with your contrast color where you'd like your tips to start. Proceed to fill in your tips. Then, use a different cocktail stick with white nail polish to dot on the floral design. The result is a sweet, playful look. To create a bright, deep blush nail aesthetic reminiscent of seventies disco fever, choose an all-over metallic hue. This look is all about prominence, so make sure that you layer up the color using several coats. However, avoid using a topcoat so the result is more metal-like than glossy. Now, where's the party? For funky, individualistic nail art, try a geometric blush look. This involves painting your nails in a pale blush, letting them dry, and then using a cocktail stick to draw a curved line where you want your tip to start. Next, fill in the tip with a graceful contrasting hue like black or navy. Repeat this process to create the cuticle effect with a different complementary color like gold or silver. For best results, opt for acrylic nails with added length for extra oomph. Blush nails can create many varied aesthetics due to the versatile shades and designs available. Experiment with different options to find out what works for you and your personal style.